As promised - the proposal! I woke up on October 13th freshly 25, to a boyfriend with lots of surprises up his sleeve. As I was hopping in the shower, I noticed Starbucks, a note and a stack of envelopes. I was instructed to open each card at the appropriate times throughout the day - 7AM, 10AM, 12PM, 3PM & 6PM. I thought to myself - that little ****, he's trying to out-do me! Zach's birthday had been a week prior and I made sure it was a good one as it was the big 3-0, so I figured he was going to do the same for my big day. 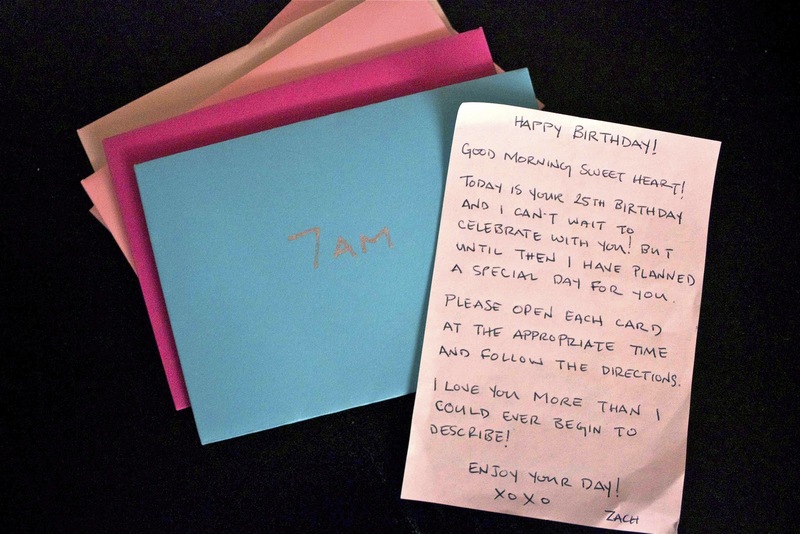 The first card accompanied my breakfast - it encouraged me to enjoy my treats and have a great birthday, the next cards followed with flowers, lunch, more flowers and finally a note to meet Z at a secret location. When I realized I was going to Coronado - I thought to myself, could this be? No, no - you're a crazy girl. But I took a picture of the sunset as I was pulling up (just in case). When I met up with Z, he was as cool as could be. I was trying to read the situation. Is he nervous? No, no - you're a crazy girl. We walked, we talked, we watched the waves, the sunset. It seems funny now, but this isn't something out of the ordinary for Z to spring on me so I continued on thinking no, NO - stop being a crazy girl! Then, just as the sun was setting, Zach stopped and gave me the biggest hug. All of the sudden I could feel his heart beating as though it was going to burst out of his chest at any moment and that's when I began to think, maybe, just maybe, this may really be happening. He told me how much he loved me, how long he had been waiting for this day and then he got down on one knee and said, "Can I ask you a question?" I began to cry. He couldn't speak. But when he said those 4 words I had been hoping to hear, all I could do was let out a not-so-subtle YES! It was absolutely perfect on all counts. 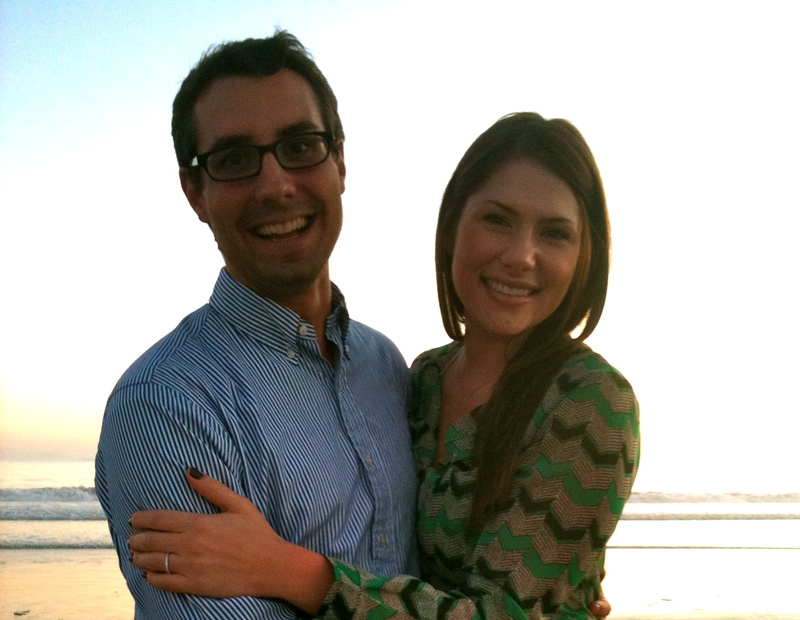 We enjoyed the moment, asked a passerby to take our picture and then began the 3 hours of calling family and friends. We capped the night with champagne & dinner at one of our favorite restaurants. Life hasn't been the same since and it doesn't look like it will be any time soon. We are so absolutely excited for this next chapter of our relationship and cannot wait for the day our families will be in one room with us celebrating this sweet, sweet love we have. *images via our engagement & the festivities that followed. 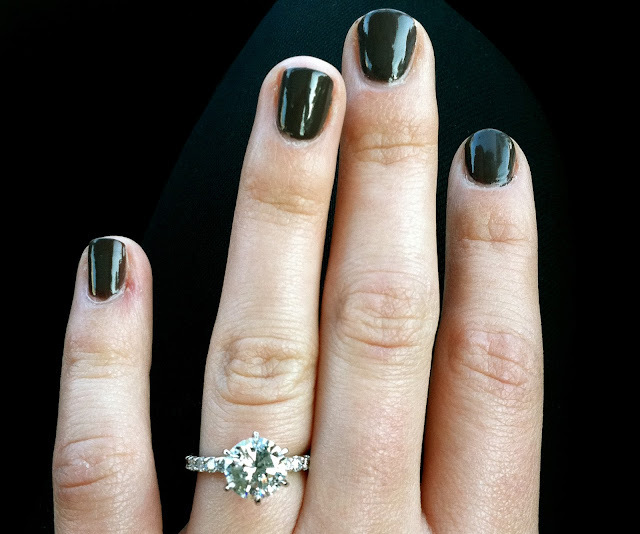 (Please excuse the nasty-I-did-not-know-I-was-getting-engaged-gray-nail-polish. I've since gotten a proper manicure :)). What a writer you could have been or maybe some day will be. Zach, you're AMAZING!!!!!! We're so happy to have you join our crazy family. Who could ever outdo a proposal like that????? Brittany, your man sounds too sweet for words! Congratulations on your engagement, you both look really happy! What a wonderful engagement story! And that ring! You are a lucky girl- but you already know that! Congratulations and thanks for sharing! What a great job he did! He's a keeper!